We have a friendly community with an attractive combination of townhouses and condominium apartments strategically located in Old Town Alexandria. Built beginning in 1978, and located along the Parker-Grey Historic District, Colecroft has been a pioneer in urban planning and is centered in the vibrant development that is occurring in North Alexandria today. Flanked on one side by a pedestrian walkway and bike path, Colecroft falls along and within the 1400 & 1500 blocks of Oronoco, and the 500 block of N. West streets. 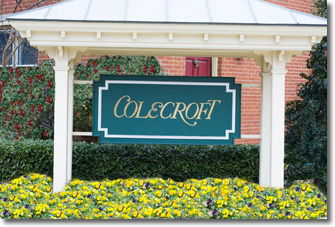 Colecroft is steps away from the Braddock Metro Station and just a few blocks’ walk to Alexandria’s Old Town city center, the Potomac riverfront, and other attractions. Ronald Reagan Washington National Airport and Washington, DC are minutes away by car or metro. If you are a resident in Colecroft, join our community email list. This will keep you aware of any important or interesting information, and provide a forum for residents & owners to communicate between themselves. Once you're signed up, all you have to do is send an email to colecroft@colecroft.com to communicate with others on the list. Please contact Ingrid Ketterman for further information at 703-707-6404 or via email at iketterman@capitolcorp.com. New visitor parking hang-tags will be provided at the upcoming annual meeting on July 18th at 6:30 p.m. If you’re unable to attend this meeting, your hang-tag will be mailed in mid-August 2018. Owners of rental units are responsible for obtaining and submitting parking hang-tags to their tenants. The new hang-tags MUST be displayed by September 30, 2018. Per the Association’s by-laws, there is one parking hang-tag per unit. Colecroft has moved to Nextdoor, which is a private social network for the neighborhood. If you haven’t already signed-up, please join now! The Board uses this group to post alerts, and other informational notices (snow plowing, meeting dates, etc.). It is the easiest way for neighbors to interact and stay informed with community updates. There is no charge for this service and you can access both online and with their app. Please visit www.nextdoor.com to set-up your account. Click here to check out more news.